For qualifying the RSMSSB Anveshak Exam, the applicants have to read all the topics given in the RSMSSB Investigator Syllabus 2019. Rajasthan Anveshak Exam Pattern observation should be done by the candidates. Download RSMSSB Investigator Syllabus [email protected] rsmssb.rajasthan.gov.in to know the exam topics. For reading the whole RSMSSB Anveshak Syllabus topics lot of time is required. Hence by start reading the Raj Investigator Exam Topics as early as possible is helpful. 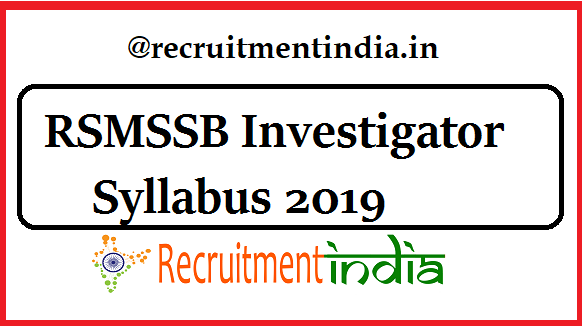 Detailed RSMSSB Investigator Syllabus 2019 that is recommended by the RSMSSB board furnished at our page. 1.1 RSMSSB Anveshak Syllabus pdf. The relevant RSMSSB Anveshak Syllabus 2019 can be found at this page. This page not only includes the syllabus plus it has provided the exam pattern that is exactly recommended by the RSMSSB recruitment board. The emergence of downloading the RSMSSB Investigator Syllabus 2019 is coming for all the job seekers because the boar conducting the RSMSSB Investigator Exam 2019 in the coming months. The exam registrations are accepting by the officials since from the date of RSMSSB Investigator Recruitment 2019 advertisement available. Thus candidates prefer to start reading the Rajasthan Anveshak Syllabus 2019 from today itself. Plenty of individuals are getting ready to write the Rajasthan Investigator Exam 2019. Hence all of these have checked for the RSMSSB Investigator Syllabus 2019 to know what are the topics are going to ask in the exam. Later they will be trying for the downloading option of RSMSSB Anveshak Syllabus pdf. Downloading of the syllabus is preferable by many of the candidates as they can refer the topics in the syllabus without the connection of internet. Hence in view of the job seekers feasibility, recruitmentindia.in delivering the syllabus in the form of list of topics and pdf format. Rajasthan Anveshak Examination would be planning very tough level by the Rajasthan Subordinate and Ministerial Service Selection Board (RSMSSB) to choose the very highly talented candidates into the positions. Ancient Culture & Civilisation of Rajasthan, Kalibangan, Ahar, Ganeshwar, Bairath. History of Rajasthan from 8th to 18th Century. Gurjar Pratihars. Chauhans of Ajmer. Relations with Delhi Sultanate – Mewar, Ranthambore, and Jalore. Rajasthan and Mughals – Sanga, Pratap, Mansingh of Amer, Chandrasen, Rai Singh of Bikaner, Raj Singh of Mewar. History of freedom struggle in Rajasthan. The role of women during the Medieval and Modern period. Architecture – Temples, Forts, and Palaces. Paintings – Various Schools. Candidates will do the mistake like once they got the Rajasthan Investigator Syllabus hey won’t look at the other useful information like previous papers or RSMSSB Anveshak Exam Pattern. This type of approach is not at all good to get the good score in this tough competitive exam. Always smart preparation only makes the candidate successful. Some important points like what are the high marks allotted topics in the previous years, how to calculate the answering time to each question, total marks and duration of the exam have to be observed by the candidate who is starting the preparation. From the Rajasthan SMSSB Investigator Exam Pattern, the question of what are the topics to be studied is answered. In accordance with the exam paper only, the RSMSSB Investigator Exam Topics are mentioned here. Rajasthan Anveshak (Investigator) Exam is a state level exam. Nearly in thousands, only the exam participants will be. If you see the vacancy which is very less when compared with the total number of applicants. Why we are saying this is to give the idea of how to face this tough competition. Attend the Rajasthan state Govt job exam with at least basic preparation. For those individuals who strongly keep the aim of getting this job, they must read given entire rsmssb.rajasthan.gov.in Anveshak Syllabus by downloading in the official page or at this page. An individual link is attached to this page so that the contenders in a single click can download the RSMSSB Investigator Syllabus.